Grove cranes ... in demand in the region. The latest products it has launched in the Middle East include the all-new Grove GRT 8100 and the GRT 880, the six-axle GMK6400, the five-axle GMK5250L and the new GMK4100L-1, all of which are proving very popular across the Gulf. “Our cranes are made to suit the global market, but the specificities of the Middle East play an important role in defining what we expect our new products to deliver to the different markets,” David Semple, SVP Mobiles for the Middle-East & Asia Pacific, tells Gulf Construction. 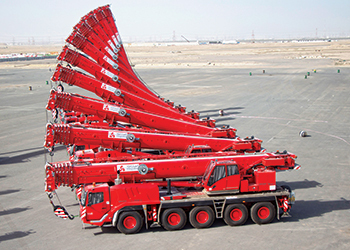 Manitowoc intends to launch further new cranes shortly in the region including the self-erecting Hup 32-27 range “as there is a market for these cranes with more and more residential projects being launched across the Middle East”, according to him. Manitowoc’s commitment to the Gulf spans over half a century, with the full-time presence of Manitowoc, Potain or Grove personnel in the region since the 1960s, says Semple. He continues: “With the spectacular growth of the Middle East came the need for bigger and more complex cranes; so our current efforts to consolidate and grow our position further are on two fronts. “From a product standpoint, our design engineers are coming up with some very innovative solutions to make our cranes easier, safer and simpler to operate. For example, our new Crane Control System provides a common platform of components and control architecture, making operation and maintenance of any Manitowoc product (mobile, crawler or tower crane) much easier to comprehend and manage for the end-user. “From a local support standpoint, the key is really in our Partner Development Programme (PDP) where we work together with our dealers to grow their capabilities and expertise across all products. Training and developing our dealers allows Manitowoc to continue strengthening its position in the Middle East,” he adds. In terms of market share, Semple says that Potain tower cranes and Grove mobile cranes enjoy a higher share of the region’s market than the Manitowoc crawler cranes – mainly due to the disadvantage of having to ship bulky cranes all the way from the US to the Middle East. He points out, however, that Manitowoc’s market share does “vary significantly from market to market in the GCC, mainly due to the relative strengths/weaknesses of our dealers compared to our competitors”. “For the Grove line, there continues to be a strong demand for rough-terrain (RT) and all-terrain (AT) cranes. Manitowoc makes the biggest rough-terrain cranes in the marketplace on two axles adhering to the original concept of an RT, that is, four wheel drive. Manitowoc RTs also have the best line pull on the market,” he adds. For all-terrains, the patented Megatrak suspension continues to be a key feature of the Grove GMK products. “This suspension system guarantees optimal performance both on and off road and also ensures maximum operator comfort and smooth operation. In recent years, Grove has dominated certain capacity classes of the AT crane market and this is true in the Middle East too. Take for example the GMK4100L and the GMK6300L, both cranes have been best-sellers in the region, mainly thanks to their long booms and outstanding load charts,” he says. For tower cranes, Semple says the company’s strategy of engineering all its cranes in France and then building them either in Europe (premium ranges – mainly MDT and MR) or in its factory in China (value ranges – mainly MC, MCT, and MCR) has allowed Potain to supply almost every model of top-slewing cranes in the Middle East. He asserts that Manitowoc is “competitive in our pricing, offers low transport cost, high performance, a high resale value worldwide and is the largest manufacturer of tower cranes in the Middle East”. Manitowoc cranes can be seen working on various projects throughout the region, where the main drivers are the oil and gas markets. Its products can be found within these segments in countries right from Iraq down to Oman and westwards into Egypt, Semple says. The crane capacities range from 35 to 450 tonnes on the ATs and 30 to 130 tonnes on the RTs. “Aside from that, our cranes have been deployed at projects that include the Aqaba Port terminal expansion in Jordan and the residential City Walk project in Dubai (UAE),” he says. Manitowoc ensures that its cranes are backed with efficient after-sales support. In order to help combat this, Manitowoc Crane Care has been issuing service bulletins about the importance of following its operation and maintenance manuals, and respecting maintenance intervals and schedules. Furthermore, in some instances it has also been re-training some of its customers on good practices to use and maintain its cranes as well as extending the training available out of Dubai. “In addition, we recently acquired a brand new CCS simulator to be able to perform better training sessions for our next generations of cranes,” he concludes. Founded in 1902, the Manitowoc Company is a leading global manufacturer of cranes and lift solutions with 49 manufacturing, distribution, and service facilities in 20 countries. It is recognised as a premier innovator and provider of crawler cranes, tower cranes, and mobile cranes for the heavy construction industry. In 2015, Manitowoc’s revenues totalled $1.9 billion, over half of which was generated outside the US.